Wow! That jungle looks so thick thousands of people could hide in it! 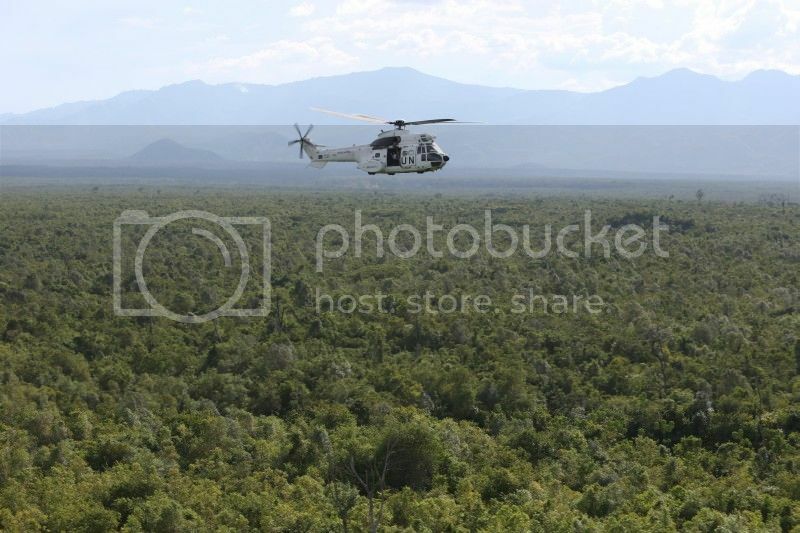 Indeed, not somewhere where you suddenly needto put the heli down quickly. Indeed, that jungle looks very thick. Not an area I'd like to be patrolling on the ground. 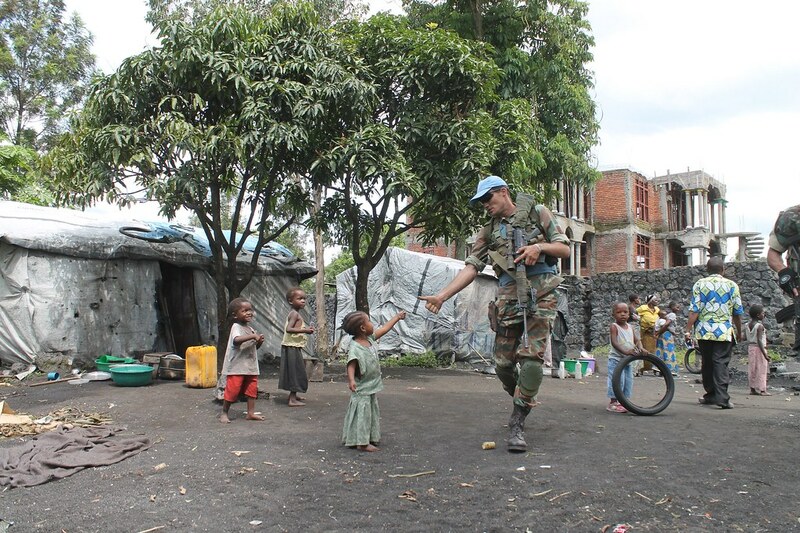 Look at this photo I found on MONUSCO's flickr page. I think this guy may be a Recce judging by his dress and what looks like an R5 with collapsible stock and a red dot sight of some sort. What do you guys reckon. my worst nightmare thats what i see. sandf great work considering. thanks for sharing the pic with us. hard school folk. It seems the death of the Malawian FIB soldier on Sunday has galvanised the FIB to ignore the DRC govt and go it alone against the ADF. 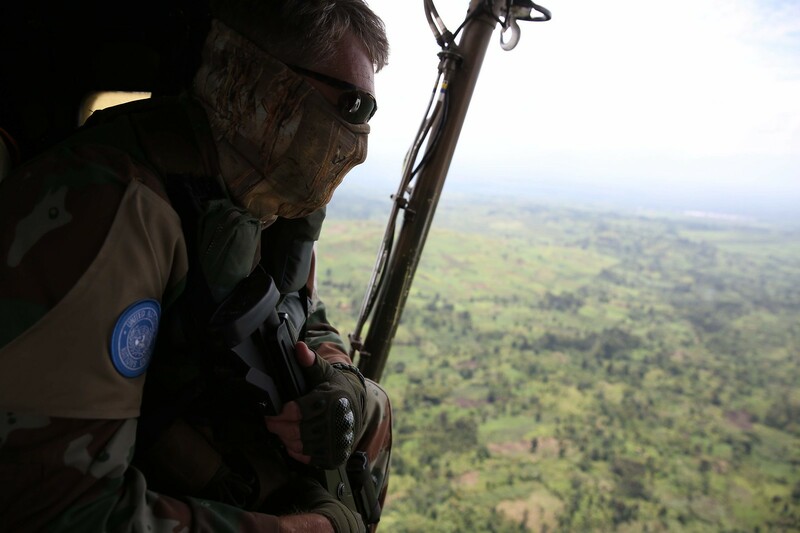 Unfortunately the article does not explain why the DRC government is unhappy with the UN force. There's a lot that article gets wrong: giving the impression of a SA operation for example. It's a FIB op under UN orders. Anyway, Kinshasa seems to think her allies among the various armed groups are off-limits. They've been successful so far by putting tainted generals in charge, knowing the UN won't work with those. i would say the no blue vest or helmet is the give he is SF. The new R4s with scopes and stocks are not SF only any more. I hear another SAAF Oryx was hit by small arms fire near an ADF rebel base at a place called Madina in the DRC. Anyone have more info? KINSHASA -- A United Nations-backed radio station says that a U.N. helicopter was attacked by suspected rebels in Congo's east. A spokesman with the U.N. mission in Congo, Charles Bambara, confirmed the attack near Erengeti in Beni territory in Congo's North Kivu province. He said there were no injuries, and little damage. The helicopter landed safely. Bambara said that Allied Defense Forces rebels were suspected in the attack. U.N.'s Radio Okapi reported that an investigation is underway. Eastern Congo is home to myriad armed groups, many vying for control of the region's vast mineral resources. Beni territory has been the site of repeated attacks by ADF rebels, who have origins in neighboring Uganda. Those attacks have killed at least 500 civilians since October 2014, according to the U.N.
Hi guys I've found what I think is another photo of SF in the DRC. His kit and rifle (Is that an R1 he has with him?) are make me think he is SF. Interesting photo this is, I haven't seen a modern South African soldier in this sort of kit before. Also note the person walking next to him that has had most of his person cut out the shot. Looks like he could be holding an R6? but the camo is wrong. The chap next to him might be Uruguayan, going by the camo. I've got a few pics of SASF in the DRC, whose owner forbade putting up online. Not sure if the messaging facility here allows me to attach photos, but PM me if you're interested.